The Creta Maris Beach Resort on Crete has released its 5th Sustainability Report, which focuses on environmental protection and the support of local communities. The Creta Maris Beach Resort on Crete recently held two special events to introduce its guests to authentic Crete, the Cretan way of life, culture and traditions. Creta Maris has launched a new blog, aiming to provide guests with complete information on Crete and the authentic Cretan hospitality. Four Greek water parks are included in the Top 25 of the 2018 Travelers’ Choice Awards for Amusement and Water Parks in Europe, released by TripAdvisor. In efforts to increase inbound tourism from Germany, the Region of Crete announced that it would be hosting the German-Greek Assembly (DGV) in November. The Creta Maris Beach Resort on Crete, recently held a number of environmental activities to celebrate the “Blue Flag” quality award, which its Kastri beach received earlier this year. Creta Maris' Kastri beach on Crete has been awarded as one of the best private sustainable beaches in the Mediterranean by Costa Nostrum. The Creta Maris Beach Resort on Crete held a “We do Local Days” thematic event and invited its guests to live like a Cretan for a day. The Creta Maris Beach Resort on Crete, has been honored with the Guest Review Award 2017 by online booking platform Booking.com. 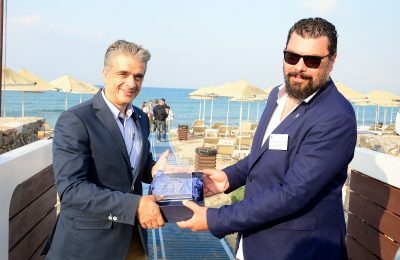 The Creta Maris Beach Resort has been honored as "Top Hotel Partner 2017" by Schauinsland-Reisen, a leading German tour operator. The Creta Maris Beach Resort presented Crete’s tourism offerings and gastronomy during the Brussels Holiday Fair 2018. The 8th International Sandy Beach Symposium (ISBS) will take place between May 25-29, 2018, in Hersonissos on the island of Crete. The Creta Maris Beach Resort, located on Crete, was recently honored with the "Treasures of Greek Tourism 2017” award for its business excellence. The Creta Maris Beach Resort for the fourth year has received the “We Do Local” certification for its efforts to promote the local gastronomy and culture. The Creta Maris Beach Resort on Crete was recently honored with the "Outstanding Package Performing" award by Expedia.com. Karatzis Group in May next year will open the new five-star Nana Princess hotel, adjacent to its Nana Beach, on the island of Crete. The Nana Beach Hotel on Crete for the third year received the “We do local” certification for its efforts to support local producers.